Imagine living in Seattle over a hundred years ago before World War I and planning an exciting Sunday excursion to Kenmore and environs by train. Train travel for business and pleasure in the Seattle vicinity began in the 1880s. In 1885, the Seattle, Lake Shore & Eastern Railroad began laying track from downtown Seattle following a route around the west side of Lake Washington and through Kenmore along what today is the Burke-Gilman Trail. It reached Bothell on Thanksgiving Day of 1885. Pushing on through Woodinville and Redmond, by 1888 the railway reached Issaquah, becoming a major regional line serving Puget Sound logging areas. Later it continued east to Preston, Snoqualmie, and North Bend. Since woodland trails connecting Seattle and Kenmore were primitive, Seattle dwellers would take Sunday afternoon train rides to Kenmore to see the wilderness. Soon they could even go as far as Snoqualmie, and Sunday excursion trains filled with sightseers ran from Seattle through Kenmore to Snoqualmie Falls. 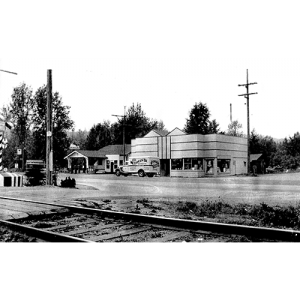 Despite its relatively short length, this railroad system benefited residents of King County, and Kenmore in particular, even though the community remained a whistle-stop rather than a scheduled passenger stop. A rail siding led to the McMaster shingle mill on the Kenmore waterfront. The rail station, decked out in the usual depot color scheme of that era Indian red with bottle green trim stood across from the mill managerís house, between the railroad tracks and the siding that led to the mill (in the vicinity of the modern-day Kidd Valley restaurant on Bothell Way). Passenger service to Kenmore ceased in 1941, but trains continued to pass through Kenmore. The SL&E line was acquired by the Northern Pacific Railroad in 1892 and was in service regularly until 1963. As late as 1965, the company was using steam-powered locomotives on the route between Woodinville and Ballard, with a crew consisting of an engineer, fireman, conductor, and three brakemen. 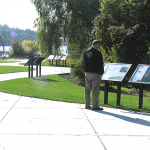 In the early 1960s citizens sought to have the Northern Pacific Railroad abandoned its route along the west side of Lake Washington in order to permit the creation of biking and walking trail on the old roadbed. The company was reluctant to sell its right-of-way, feeling it might need the route in the event of a railroad emergency. Then a railway wreck occurred on the eastern lakeshore, thus legitimizing the company's concern. Jo Ann Evans - A Montanan by birth and a Washingtonian since 1954, Jo Ann Evans is a long-time activist in the Puget Sound Theater Organ Society and plays the 1924 Wurlitzer organ restored by her husband, Russ. 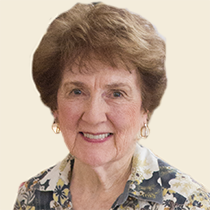 She also serves on the boards of Arts of Kenmore and the Kenmore Heritage Society and received a McMaster Heritage Award in 2007 for community service. Immediately following the wreck, the Northern Pacific routed a train through Kenmore in order to bypass the accident At about 2 AM the long line of freight cars came rumbling and clanking along the almost-defunct right-of-way, pulled by a huge diesel locomotive. Following regulations, the crew blew the throaty air horn at every crossing. The crew enjoyed the spectacle of house lights coming on all along the lakeshore route as people rushed outside in nightgowns and pajamas to see what was going on. Not long after this incident, however, the Northern Pacific gave over its claim to the right-of-way. In 1971 the Northern Pacific, Great Northern, and Burlington railroads merged, creating the Burlington Northern Company. Burlington Northern then abandoned the line along the western lakeshore, allowing the Burke-Gilman Trail to become a reality, using the old rail bed from Lake Union to Kenmore. It appears a train and car are racing eastward in this 1930 photo, with Lake Forest Park in the background. At the left above the tracks, it appears log booms are in the lake. In 1976, my husband and I were searching for a home roomy enough to hold our restored 1924 theatre pipe organ. We found what we were looking for in Kenmore, just up the hill from the drive-in movie theatre. Can you believe we watched movies—silently with binoculars—from our bedroom window? Pheasants, quail, raccoons, and possums roamed among the fir trees and blackberries and native shrubs were abundant in the woods behind our home. The Burlington Northern train tracks were still in place, later to become the Burke-Gilman Trail. Ostroms Drugs was still in Kenmore Village, surrounded by a succession of business enterprises in adjacent storefronts — from the Wigwam store to a state liquor store. Then, as now, Kenmore was small enough so that one person could make a difference. Retirement in the early 1990s gave me time for volunteering, and where better to pitch in than in one’s back yard? Volunteer opportunities can appear quite unexpectedly. The reader board erected in 1978 by the Kenmore Baptist Church on Bothell Way provides humor, encouragement, and on occasion, important local news. 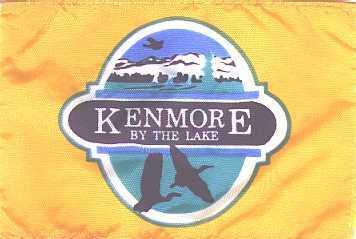 In the early 1990s, the sign encouraged passersby to attend a meeting at Kenmore Junior High to explore the pros and cons of Kenmore incorporating as a city. Ah! This was important — a perfect opportunity to get involved. Kenmore voters had rejected incorporation proposals six times between 1950 and 1970 but local opposition receded when passage of the state’s Growth Management Act in 1990 raised the prospect of unincorporated Kenmore being annexed by one of the cities around it. This did sit well. Having a small-business retail sales background, including advertising and graphic design, gave me experience and skills useful for what became the final incorporation effort. I joined the team, worked hard, and cheered with the many volunteers when in September, 1997, incorporation was approved overwhelming by voters. Kenmore became a city the following year, some 97 years after a settlement named for a village in Scotland and a city in Ontario was founded around a new shingle mill next to the lake. A surge of civic activism led to formation of two important civic organizations. The Arts of Kenmore organized the Kenmore Art Show, now in its 20th year, and the Kenmore Heritage Society launched a series of historic-preservation projects. Serving as photo editor for Kenmore by the Lake: A Community History inspired my growing interest in local history. 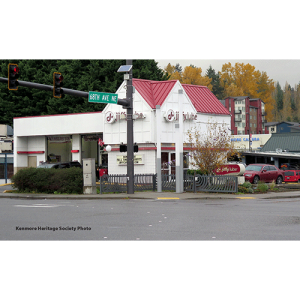 I invite you to come back next month to learn more about how we got to where we are today, and perhaps also enjoy my companion photo feature, “Then & Now” – a side-by-side view of places in early Kenmore and the same places today. About this blog: In the coming months I will share with you some great stories spun from Kenmore by the Lake: A Community history about how Kenmore evolved from a rough, remote settlement on Lake Washington to a semi-rural bedroom community and finally to a thriving, exciting young city with a special hometown feel. Henry Jang, my dad, traveled by boat from China to the United States in 1925. We don’t know the circumstances, but we do know he was sponsored by a Chinese man in South Dakota. Dad’s name was Zhang, a common name in China. Entering the states, men named Zhang, most unable to speak English, became Jang, Jung, and Chung because U.S. immigration officers had to come up with a name for their forms. Dad was 15 and traveling alone. He couldn’t read or write Chinese, and he couldn’t read, write or speak English. He came from Kaiping, a region south of Canton. The people there were poor. At the time most Chinese in America were from Kaiping. I know almost nothing about dad’s life in China, and I did not know him well in America either. Mostly he worked hard and had little time for family. I am still trying to learn more about him. Once I hired a man fluent in Chinese to talk to people in China who were second cousins and they may not have known him. But the man was not a professional interpreter and didn’t speak the same dialect as those he interviewed. So I did not learn anything. Dad was what was known as a “paper son.” Between 1882 and 1943, immigration was limited by the Chinese Exclusion Act. But you could come if you had family here. A Chinese man in South Dakota sponsored him. But he had to answer certain questions, and his answers had to match those of his “father” in South Dakota. Questions like, who was the blind man on the corner in your home village? The immigration officials did not speak Chinese, and the new arrivals spoke no English, so translators were hired. Supposedly the translator worked for the government but often he made sure that the immigrant’s answers matched those of the sponsor. My dad wound up, not in South Dakota, but in Fargo, North Dakota at a Greek restaurant. He was given room and board and worked before and after school. He learned to read and speak English in three years. We don’t know why he went to Fargo. There was a Chinese café in Fargo, but we know why he didn’t go there. There are a lot of mysteries here. My dad married a Swedish woman, Cora Sandry. She and her sister were two of the best-looking girls in town. My Swedish grandfather hated my dad’s guts because he was Chinese. My parents had three boys. I was the youngest. My mother left us in 1944. We moved to Stockton, California with dad and I enrolled in first grade. Dad ran a café in each town we lived in. My mom returned for a time, but could not get along with dad. So she kidnapped us in 1947 and took us to Seattle, where her sister Alvina had become a madam. My aunt also ran a nightclub for a bootlegger named Russian John. My mom was a cocktail waitress. Mom put us up with cousins in North Bend, and came to visit once a month. Later we moved in with another family. I remember only that they were fat and poor and ate a lot of potatoes. Then we lived with two retired people. Here we had to have manners. We had to dress up for dinner. Until that point I had never eaten as a family unless we went out to dinner. Then dad found us and we lived with him. He ran a couple of restaurants in North Bend, then in 1950 opened a restaurant in Kirkland. I sold newspapers. My brothers worked as pin-setters in a bowling alley. In June, 1952 we came to Kenmore where my father became known as the Hotcake King. But at first, to build the business, we also served Chinese food that first summer. There was no Chinese food around then. We worked 12 hours a day. Dad was in the kitchen, my brothers waited on customers out front, and I washed dishes and cut up vegetables and peeled shrimp. When school started, dad switched to American food only, which was much easier to prepare. We served hotcakes, bacon, or ham for breakfast, and turkey or beef or pork dishes the rest of the day. The hotcakes were 30 cents, all you could eat – bacon or ham extra. The daily lunch special cost one dollar. The customers were mostly working men. After school I washed dishes and swept the floor. I learned a few things about my dad listening to him talk to the customers. When the restaurant was slow, he would play cards with “Old Man Mac,” a regular. Guys would come in and join the game. There was a tavern next door. Dad had quite the personality. But we didn’t talk much. My dad died of cancer in November, 1962. That fall I ran the restaurant until he died. I got up at six in the morning to open and worked until ten at night. Then we closed the restaurant. About this blog: I was a youngster growing up in Kenmore during the post-World War II period. I will be writing periodically about what life was like then in this sleepy little highway town at the north end of Lake Washington. Let’s look at some recent law-enforcement history through the 37-year career of Deputy Gary Zornes of the King County Sheriff’s Office. Gary’s career began in October, 1980. After graduating from the police academy, he was assigned to the North Precinct in Kenmore, serving unincorporated areas of King County north of I-90 between Puget Sound and the crest of the Cascade Mountains. He patrolled the Kenmore area for most of his career. If you attended Kenmore Junior High (now Kenmore Middle School) or Inglemoor High School over the past 22 years, you met Gary. As School Resource Officer, he helped keep the schools safe. Gary chaperoned your prom and homecoming dances. He was there for your sporting events. He also assisted with the “Live Drunk Driver Accident” drill each year before graduation to emphasize the dangers of driving under the influence of alcohol or drugs. One of Gary’s most memorable arrests came early in his career. He was returning from a training session with two other deputies and a sergeant (me). Gary and the next most-junior deputy, Donn Potteiger, were riding in the locked-in back of the patrol car – seating usually reserved for prisoners (there are no interior door handles). Radio dispatched an alert for a stolen vehicle. Shortly thereafter what to our wondering eyes should appear but the stolen vehicle and two felonious occupants. Our driver, Deputy Mark Edmonds, gave chase. After a three-block pursuit, the stolen car crashed into a dirt bank. The suspects ran from the wrecked car. Edmonds and I jumped out, pursuing the suspects on foot, forgetting that Gary and Donn were left behind, locked in the back seat. Being a bit skinnier then, Gary squirmed through a narrow opening in the divider between front and rear seats. You now know how Gary’s slight frame earned him his nickname “Bones.” Gary freed Donn before joining the foot pursuit. Both suspects were apprehended – another successful day for law enforcement and another lesson learned, as Gary has reminded me on several occasions. Police work changed a lot during Gary’s career, and he was often a leader in pioneering the new ways. He was among the first officers in the United States to use laptop computers in the patrol car beginning in the mid-1980s. Gary became a Technical Flight Officer for the Guardian One helicopter unit in 1994, assisting with navigation, communications, use of FLIR (a thermographic camera that senses infrared radiation), and searchlight operations. Gary volunteered to become a member of the initial School Resource Officer program in 1995, one of the first such programs in the nation. Gary was also a Beta tester for the last three electronic records systems for the Sheriff’s Office. When the city of Kenmore incorporated in 1998, Gary, by then a Master Police Officer, became one of the city’s first officers under a police-services agreement between Kenmore and the King County Sheriff’s Office. He also helped field-test the first “mobile data units” in 2003, querying the police data systems directly from the patrol car. Over his career Gary has helped to train more than 100 new deputies, quite an accomplishment. He has received many commendations, including Precinct 2 Deputy of the Year in 1997, King County Sheriff’s Deputy of the Year in 1998, and Inglemoor’s Educator of the Year in 2010. Gary was also first runner-up for the Washington School Safety Organization’s SRO of the year in 2017. Gary’s last shift was on Christmas 2017. A grateful community wishes him and his family the best in a well-deserved retirement. Next month we will take a look at a bit of the Fire Department history. I welcome feedback and personal stories from readers. Feel free to contact me at davidcmaehren@kenmoreheritagesociety.com. About this blog: Public Safety is essential for a community’s well-being. Kenmore is fortunate to have excellent police, fire and emergency medical services. Our public-safety systems have evolved over time. In the early days there were no local police officers, no firefighters, and no emergency medical services. This blog will document the history of public safety in our area. A few interesting stories will illuminate the way. I love families, especially my own, and I love fashions. That’s why I’m thrilled to start writing a monthly blog that will deal with both subjects. I’ve discovered that honoring fashions of the past is not only fun and fascinating, but also fosters understanding of our own history. Allow me to introduce myself. I have lived in the same home in Kenmore for 48 years. My husband, Jack, was a Navy chaplain. When he retired from the Navy in 1969, we moved to Kenmore. We both were from the Midwest – me from Minneapolis, Jack from Kansas. We fell in love with the beautiful Northwest and decided this was where we wanted to spend the rest of our lives. He became Kenmore’s first Mayor in 1998. Our love for Kenmore is evident in the photos and memorabilia found in every room of our home. Out in the front yard the Kenmore flag and a couple of metal blue Herons proudly represent Kenmore, too. Jack passed away in 2008. We both were history buffs from the time we were kids. At the time of his death, Jack was president of the Kenmore Heritage Society and I was a member of the Board of Trustees. I also co-chaired with Kenmore historian Priscilla Droge the editorial board that oversaw publication of Kenmore by the Lake: A Community History, published by the society in 2003. It was an amazing four-year effort. More than 250 Kenmore residents contributed stories, information, photos, and maps for this wonderful book. 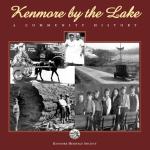 Kenmore by the Lake is available at Kenmore City Hall and at Ostroms Drugs. Jack restored three Model A Fords (built in 1928-1931). In the early 1990s, he served as national president of the Model A Ford Club of America. On our club’s Model A road trips, we collected historic artifacts, visited museums and historic sites, and did a lot of research. For a time, I chaired the club’s Era Fashion Committee. This is one of the reasons my blog is entitled Fashion & Families. In my younger years, I worked in the fashion world, teaching classes on modeling and self-improvement in Minneapolis. I also wrote four books on these subjects for teenage girls and young homemakers and for many years wrote a monthly column for Campus Life magazine. I fell in love with era fashions when Jack got into Model A restoration. At the regional and national meets, we took part in era-fashion competitions with categories for men, women, and children. Awards were given to those who modeled authentic clothing that actually had been worn for motoring during the four years in which the Model A Fords were made. This was a serious event. A large group of well-trained and knowledgeable judges took an entire day to examine every element of a competitor’s attire—shoes, hats, gloves, and so on, even underwear! Winners were announced at a fashion show the last night. We had such fun treasure-hunting for the fashions and posing in our era outfits with the Model A’s we enjoyed so much. I’ve discovered that honoring the fashions of the past often stimulates our understanding of history. I hope this blog will encourage many of you to take out your old family albums and pictures and begin researching your family history. This could be a fascinating project for an individual or an entire family. How I wish I had asked my parents and grandparents more questions about what life was like back in their own “good old days!” Look at those photos from your old albums. What do the fashions and method of dressing tell you about your own family? Next month we’ll find out what our ancestors wore and what they experienced while enjoying winter sports. Please join me. I think we can have a great time doing this together while developing a greater interest and understanding of history as individuals and families. About this blog: I love families, especially my own, and I love fashions. That’s why I’m thrilled to write a monthly blog dealing with both subjects. I’ve discovered that honoring fashions of the past is not only fun and fascinating, but also fosters understanding of our own history.